John McGuinness hopes to race the Norton V4 at the North West 200 in May. The 23-time Mountain Course winner is desperate to compete at the North Coast road race in preparation for the TT on the new Norton V4 machine. 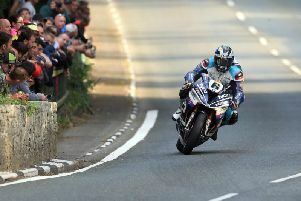 Morecambe star John McGuinness completed a parade lap on the Norton at last year's Isle of Man TT. The Morecambe man made a successful return to the Mountain Course at the Classic TT in August, where he won the Senior race on the Paton. He also raced at the Macau Grand Prix alongside Martin Jessopp in the PBM Ducati team, finishing in tenth place. As revealed in the News Letter in January, Mervyn Whyte was keen to examine the possibility of permitting Norton and McGuinness to race at the 90th anniversary NW200 this year. Under FIM homologation rules, machines like the Norton and Honda RCV are not eligible to compete at the North West, although special dispensation can be granted in individual cases. However, it is understood that one additional obstacle standing in the way of Norton’s current V4 machine is its 1200cc motor. The machine McGuinness has tested in recent days at Cadwell Park runs Norton’s own engine as opposed to the Aprilia-derived motor used at the TT last year by Josh Brookes in the SG7. Under the regulations at the North West, four-cylinder machines must be limited to a maximum of 1010cc. Negotiations are ongoing to find a solution that allows McGuinness to be on the grid on the eye-catching silver racer in some configuration in May. Previously, the 46-year-old stated his desire to return to the event and made a plea to the organisers to allow the Norton to take part.